Ambient music can so easily fall into the trap of long, repetitive and frankly, quite boring swashes of synth pads. There’s all sorts of that kind of stuff out there. So when something like Dadirri’s Electrified Space Bacterium comes along, it is a welcome shock to the system. This is ambient music that is alive, complex and stimulating. Not that you can’t just kick back and chill out to it, but it is the kind of ambient music that Brian Eno described, music that can just as easily fade into the background as it can grab your attention and make you really listen. Dadirri is a side project of Australian musician VisOrtis, who has been involved with numerous bands, collaborations and solo projects over the years, including Vocabularinist, DJ Urinal Cake, buMscUzz, and Mekigah. On this particular project, he teams up with 30 year veteran home taper Ken Clinger from Pittsburgh. The music on Electrified Space Bacterium is very different from the chaos and mayhem often present in VisOrtis’ other projects, but although it is a much more chilled out, ambient space sound, it can be just as challenging to listen to, which makes it far more fascinating than your run-of-the-mill ambient music. The pieces on this album are mostly shorter tracks in the 3 1.2 to 6 1/2 minute range, which gives VisOrtis and Clinger a chance to conceptualize and execute a number of different sonic realizations. The music slips sideways through lyseric landscapes, easing from lilting and gently melodic to disquieting and even disorienting, often within the same piece. It’s like listening to music broadcasts from another world, mere hazy fragments reaching your ears, as it is joined by rich, organic, earthly resonances that paint hallucinatory colors within. Throughout the album, and perhaps tying it together, there is a sonic motif, something like the sound of a million bells ringing, caught on the wind, and heard from far away, that permeates many of the tracks, sometimes rising to the surface, sometimes sinking to depths. It’s quite a unique sound, and lends elements of both wistful nostalgia and intriguing mystery to the proceedings. This is more than just ambient music. 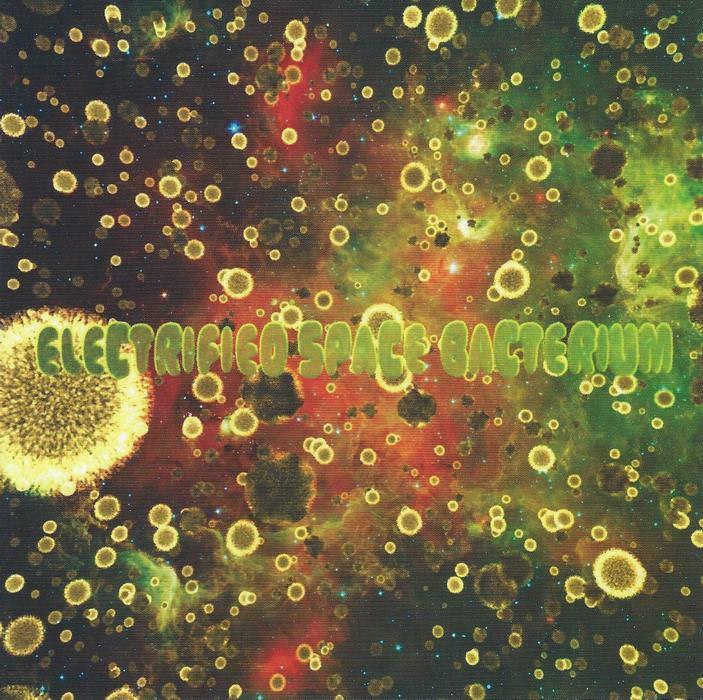 Electrified Space Bacterium comprises fully realized psychedelic environments, trippy dreamscapes for your journey down the ambient expressway into the blazing night. Lay back in the darkness with the headphones on and get swept away.